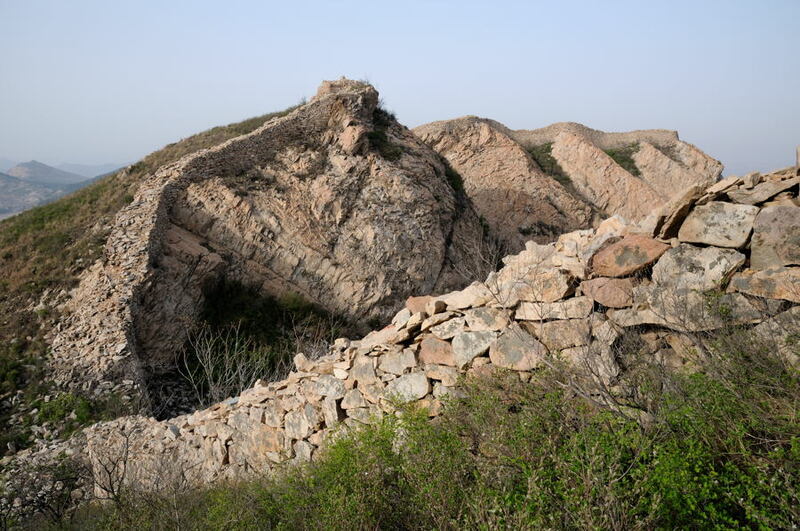 Sandaoguan is located six km north of the Shanhaiguan Pass, running across the ravine between two mountains-the west one, 398 meters above sea level and the east one, 292 meters. Erected on precipitous slopes, the Great Wall here reaches 70 degrees in steepness, looking like a soaring dragon and was dubbed the “Hanging Upside-Down Great Wall”. Three barriers were erected across the bottom of the ravine. The first one was at the opening of the ravine, with a narrow gate-the sole access to the second barrier, the second one was at the midway point, which served as the main pass gate, on the top of which there used to be a watchtower, and the third one was at the end of the ravine, also with only one narrow gate. Because of the three barriers and three gates, the stronghold was called Sandaoguan (Three Barriers Pass). Sandaoguan village in the valley was the administrative seat of the pass. Going northeast from here, one can reach Si’eryu, the terminal of the Shanhai Route section of the Great Wall, and further on, one can reach the starting point of the Shimen Route section of the Great Wall. West of Sandoaguan Village lies Xuanyang Cave. Inside the case the “Poem On Xuanyang Cave” is inscribed. It was written in 1602 by Zhu Hongfan, the Assistant Commander of the Shanhai Route Section of the Great Wall. In the valley are cliff carvings dating from the Chongzhen reign period (1628-1644) of the Ming Dynasty. In 1985 this valley was developed into the Mt. Changshou (Longevity) Scenic Area, which contains the Cave of Miracle-Working Doctors, where statues of distinguished doctors of ancient China such as Hua Tuo, Zhang Zhongjing and Li Shizhen have been erected. There are rocks engraved with the Chinese character shou (longevity) in a variety of styles by outstanding calligraphers. Visitors who like off-path hiking may take the route in the valley called Duanmuchong north of Mt. Changshou. Along the route, one can find Housi Temple, Tuanyuan Temple, site of an ancient hot spring, and rocks of grotesque shapes. This area lies beyond Yanse Lake, and therefore is difficult to access. Traveling westward from here, one can find the ruins of Baita (White Pagoda) Temple in Baita Village, a big rock resembling an elephant’s trunk, the old house which served as the headquarters of General Zhang Xueliang during the second Zhili-Fengtian War in Shahezhai Village, and an old ginkgo tree said to be over 1,000 years old in Qianshuiying Village.